Good morning, RVA! It's 54 °F, and today looks a lot like yesterday: great! Expect highs near 80 °F, sunshine, and positive attitudes. Jackie Kruszewski at Style Weekly covered the memorial service for the two teenagers killed in Mosby Court last week. The president of the Federal Reserve Bank of Richmond, Jeffery Lacker, resigned after admitting he leaked information to MedleyGlobal Advisors. Here's his statement and here's a bit of background from the NYT. What does it mean? I'm not sure! Lacker was set to retire this year anyway, and this random chart from the Wall Street Journal ranks him as one of the "least useful as guides to the course of monetary policy." Andy Garrigue at the RTD talks to a couple beer collectors about The Veil Brewing Co. in Scott's Addition. The Veil's national success fills me with gladness, but beer collecting and trading is not one of my hobbies. Beer drinking is, however. Also collecting and reading government PDFs—see, we're not so different, beer collectors! The incredible Julien Baker plays the National this Sunday (a sold-out show with the Decemberists), and Shannon Cleary at Style Weekly sat down to talk with her about faith and emo. If you haven't heard her debut album Sprained Ankle, what are you even doing with your life? I will always link to anything about Duron Chavis, because he inspires me with his deep commitment to making Richmond a better place. So: Here's an interview with him in Richmond Magazine by Samantha Willis! Petersburg City Council voted last night to increase their water rates, Chelsea Rarrick from WTVR reports. This is the first step in paying down the $13 million owed to the Appomattox River Water Authority. Right now, Senate democrats are in the middle of a filibuster to stop the confirmation of Supreme Court nominee Neil Gorsuch. You can watch live over at C-SPAN. Nats host the Marlins tonight at 7:05 PM. 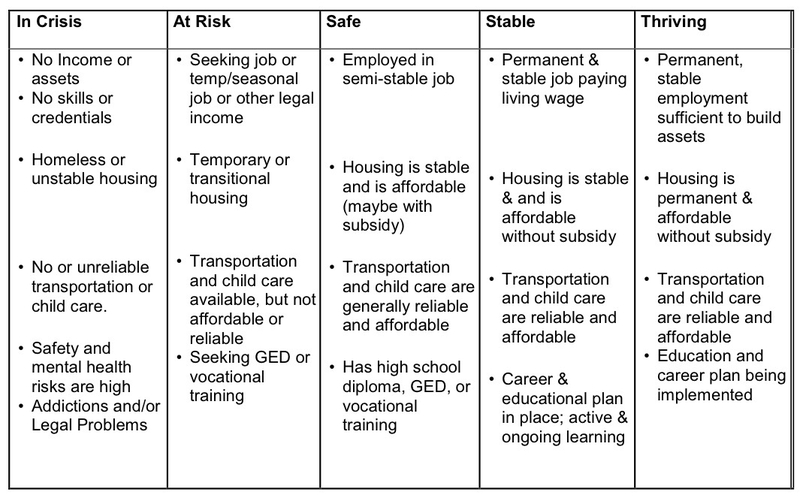 In the Mayor’s recent budget summary, he listed a goal to “Move 1,000 people a year out of poverty, using the Community Wealth Building Matrix as the framework.” How does, and how will, the city accurately count the current and future numbers of our neighbors living in poverty? In other words, how will we be able to gauge the city’s progress toward this goal? To try and find the answer I spent some time with the Proposed Annual Fiscal Plan for Fiscal Year 2018 (PDF) and the mayor's Annual Report on Poverty Reduction and Community Wealth Building Initiatives in the City of Richmond, Virginia. If I had to make an educated guess as to where that "move 1,000 people out of poverty" line comes from in the mayor's budget, it'd be from that first goal. 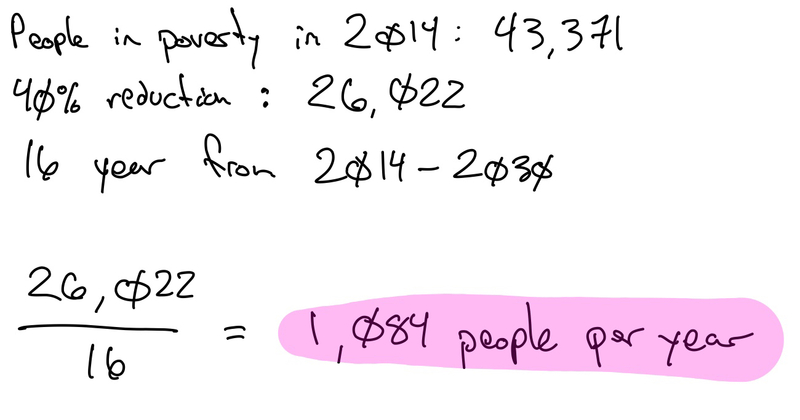 To reduce the number of people in poverty by 40% by 2030 we need to elevate about 1,000 people out of poverty per year (napkin math here). While it is possible and desirable to track year-to-year changes in the Census poverty numbers for the City, the annual figures have uncertainty attached to them (the statistical margin of error). It may take five to ten years to definitely detect long-term trend change in the poverty rate: that is, to be able to state with near or total certainty that the poverty rate has declined (or increased). Hmph. So while the data to measure poverty in Richmond exists, unfortunately the year-to-year Census data has some uncertainty attached to it that makes knowing if we're hitting our annual goal of elevating 1,000 folks out of poverty a challenge. I shot a couple emails to the Office of Community Wealth Building to see if they have any other metrics they're using but haven't yet heard back. And remember, the Office of Community Wealth Building has other metrics they're held accountable to in the mayor's budget: number of people who got jobs after enrolling in the Center for Workforce Innovation, number of on-the-job training work experience slots, and number of people enrolled in the Building Lives to Independence & Self-Sufficiency Program. So. That was a lot of words to say "The Census, I guess?" I know, Lance, not very satisfying. And yet in fashion today, gray remains an often-expensive aspirational symbol, the same way Kondo-ing your closet is more a sign of excess resources than a true desire for less. It’s why Zuckerberg has his gray shirts, and why I looked for gray clothes for my meeting. Choosing to be invisible, particularly while maintaining your own identity, is a privilege that not everyone can access. Designing your own uniform, after all, is more empowering than having one forced upon you.